Searching for an Arizona Retirement Community? Robson communities in Arizona are a popular choice for those searching for a home in an active adult community? Arizona is a mecca for snow birds who flock to warmer climates in the winter months. But, many are now choosing to live year round and why not? The lifestyle is tough to beat. Arizona summers are brutal, but many have chosen it as their year round residence and opt to do their travel in the summer months. Whether you are looking for a seasonal or year round home, Robson Communities in Arizona offer some of the finest amenities. The first step is to determine where you want to live. Robson communities in the Phoenix area are located on both the east and west side valley. There are definite pros and cons to both. 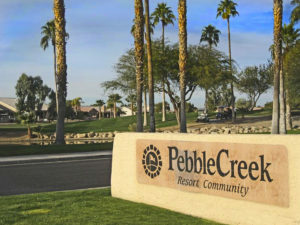 Pebble Creek is the Robson community on the west side in the town of Buckeye. And, on the east side you will find Sun Lakes, the largest with just under 10,000 homes. Plus, Sunbird is a less expensive Robson retirement community just a few miles east of Sun Lakes off of Riggs Road. Further south in Casa Grande is Robson Ranch. But, if Tucson is a location you are interested in, you have Saddlebrook Ranch as an option. You may want to visit all of them to get the best feel for your lifestyle. 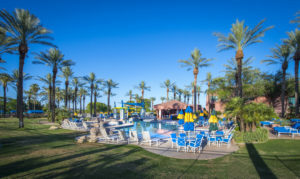 Robson Communities in Arizona offer Resort Amenities. These Robson communities are a playground for active adult seniors. The age restriction of 55+ is appealing to many. But, did you know that in some communities you can be 40? There are restrictions and limitations, but it gives the option for some to consider the community at an earlier age while they continue to work. No children under the age of 19 may live in the communities. What is your pleasure? Golf, tennis, the growing sport of pickle ball, senior softball, workout classes or just hanging out by the swimming pool? You don’t have to choose just one. These Robson Communities in Arizona offer homeowners plenty of options to choose the activities they enjoy. If you golf, it is easy to join in with a men’s or ladies or couples group. Hone your short game at one of the practice facilities. And, there are hundreds of clubs to join such as hiking, biking, arts and crafts, computer, cards, quilting or just about anything you could possibly imagine. And homes are not as expensive as you may imagine. Arizona real estate prices have risen over the past few years, but by many other states it is very reasonably priced. Many of the amenities are included with the homeowner association you pay such as use of the swimming pool, club house, restaurants, bars and all common area space. You will pay additional fees only on those amenities you choose to use like golf, tennis, pickle ball, fitness classes and any classes or concerts you may attend. If you are ready to learn more about Robson communities in Arizona, contact The Kolb Team here or call us at 480-440-0849. We are your Arizona retirement community real estate specialists!